This high quality top and skirt ensemble with coins and beads is a great starter Belly Dance costume. It's also a fun and comfortable ensemble for Halloween or any costume party! Set includes chiffon bra with pads and a multi-layered skirt with privacy panel. 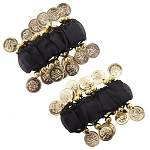 This high-quality black and gold set is a great starter Belly Dance costume. It's also the perfect one-stop solution for Halloween or any costume party! Set includes chiffon bra with pads and a multi-layered chiffon skirt with privacy panel. Bra Top: Comes in one adjustable size that ties in back and has adjustable straps; foam pad inserts sewn in. Can be worn alone or over a regular bra for more support. Chest- 35 inches; Underbust- 27 - 35 inches; Ties- 13 inches each; Shoulder Straps- Adjustable from 8.5 -16.75 inches each. Very pleased with quality. I am 5'3" & wear 11-12 pants & I ordered the M/L. It fit well and will fit even better as I continue to lose weight. The top can be worn alone but doesn't provide much lift/support by itself so I prefer it as a cover. I would recommend this as a great practice outfit. Dressing the part really does make a difference when you practice- you'll FEEL sexier! Very fast shipping and excellent follow-up. I'll be doing business with BellyDance.com again! Q: Did you have it in purple small size for women ? Can you send via express maiñ? A: Hi Viv, Thank you for your inquiry. Yes, this beautiful costume is available in Purple with Gold coins - item #2422 and Purple with Silver coins item #4290. I hope this helps.